I'm not sniffling, you're sniffling. I’m sitting here on a plane to Los Angeles, an entire row to myself (and a box of tissues, sniffle sniffle), and I’m thinking “gosh, does this make anyone else nervous too?” I mean, a LOT of us have a whole row to ourselves, flying Boston to Burbank on JetBlue this evening. Are we balanced enough? Does this plane have enough staff or passengers to save ourselves? Passenger: A passenger hopes she’s not going to crash, basically just trusting that the pilot knows what she’s doing. Pilot: The pilot believes she’s not going to crash, because she has all the training and preparation to succeed in any circumstance. Engineer: The engineer who built the thing knows the plane won’t crash, because she trusts in the laws of physics, loft, gravitational pull, mechanics, or what-have-you. You catch my drift. You can apply this to any given aspect of your life, but today it’s correlating precisely with my sinus infection. That’s right kids… boogers. I said yes to this 36-hour trip across the country and back – just a few hours after calling in sick for the first time in likely a decade – because I know I don’t really get sick. It never lasts more than a day or two if I do. I’ve heard my whole life that it’s in my strong blood, thanks to my grandpa Bill Robie. It’s my engineering. One more thing: antibacterials gross me out. I’d rather sip from your dirty glass than squirt Purel chemicals on my hands. Okay, I’m losing you; I can tell. My point here is that maybe, just maybe, if you expect to get sick you will. 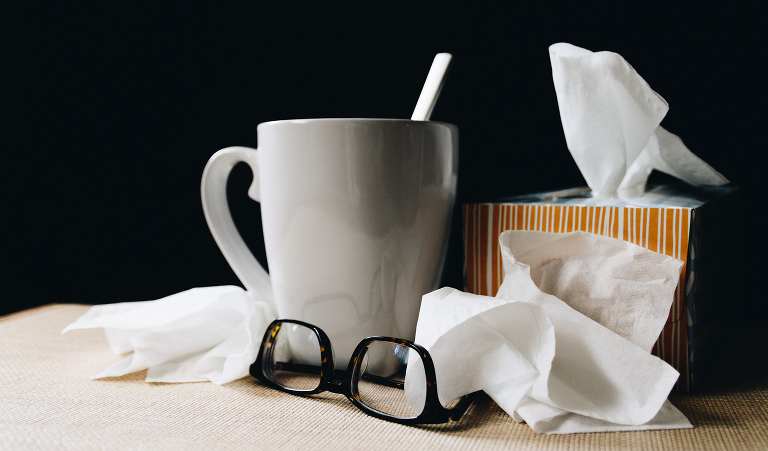 If you find yourself saying you always catch a cold when you travel, you might. That being around kids spreads germs, they’ll getcha. On the other hand, if you pop a little tablet that says “vitamin C” on the side, you’ll probably believe you stand a better chance. If you actually feel rested, fulfilled and ate your veggies all week, you’re not even considering the option of getting sick. No tablet necessary. You absolutely might be scientifically correct in reaching for the Purel, but the law of attraction would suggest that by willing yourself not to get sick, you’re reinforcing the getting sick. You’re thinking about getting sick, whether you want it or not. Voilà! The universe is at your beckon call. Here’s a tissue. Tomorrow morning will mark 48 hours and thus the end of the official calendar invite for this sniffle. I’ll be in some crazy Hollywood studio for the day with a (wait for it) baby products client, and then I’ll board an 8pm red-eye back home. I’m jazzed for a weekend ahead with friends. Will everyone around me catch a cold? Maybe that’s up to them.